Spaghetti And Lasagna Sauce recipe by swtmanoo at PakiRecipes.com. 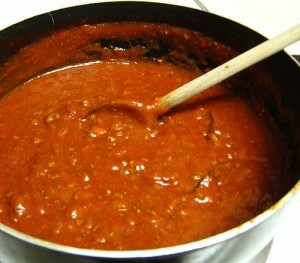 A fabulously flavorful homemade spaghetti sauce with tomatoes, onions, garlic, basil and oregano. Stewed: Cooked by simmering or slow boiling, as food. Blend the stewed tomatoes and crushed tomatoes in a blender. In a stock pot or large kettle, brown the ground beef with the onions, peppers, garlic . Pour in tomatoes, and reduce heat. Add sugar, basil and oregano, and simmer about 40 minutes.